Starting with where we stopped last time, March and April - They were rather quiet months, I took this time to recover from the New Zealand tour and have some much needed R&R. The month of May saw that things started to pick up again with great concerts and experiences. I full-filled a life long dream of mine - to play guitar with the one and only 'Tommy Emmanuel'! 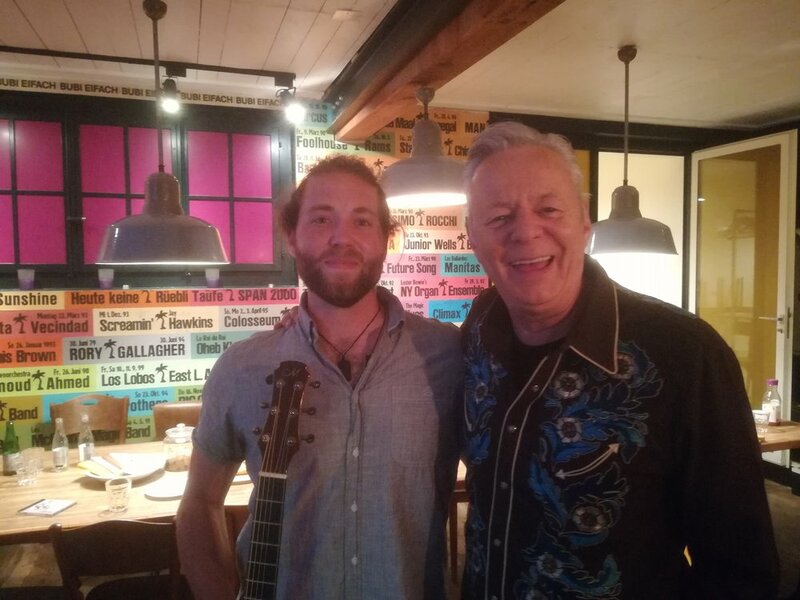 I went to his concert in Ruben, Switzerland where we had a backstage jam, it was a huge moment for me to share some music with this guitar master. 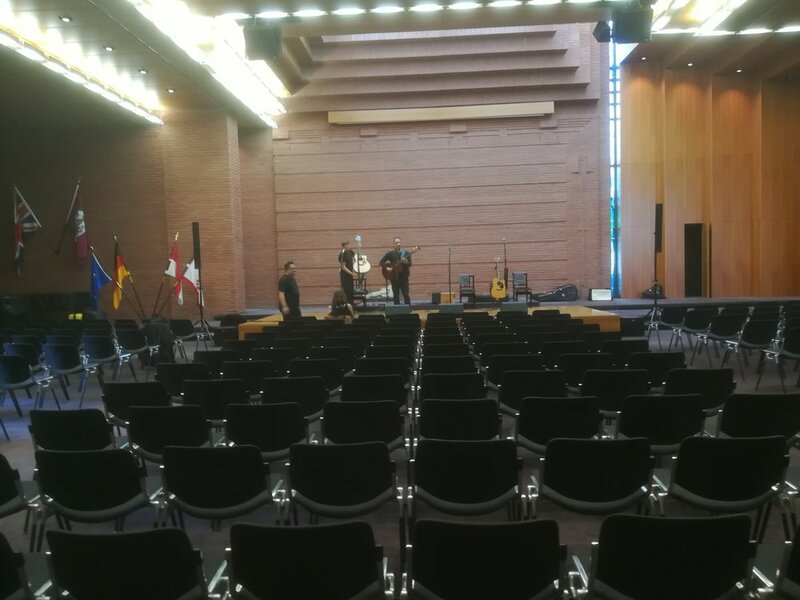 I had the pleasure to open for 'Celine Huber' (and band) for the launch of her new Album ‘Auf der Suche’ in Lorrach, Germany. I also hosted my first concert back in Basel for 2018 at a fantastic venue called ‘H95’ for the official release of my CD ‘Home’. This was a great night, there was a big attendance, I could use my new ’TIM’ system from 'Schertler' which was sounded amazing and I was able to catch up with many musicians and friends for the first time this year - again, thank you to everyone who came! Sound Check with the JETSAM! The Venue with the Modern Maori Quartet. With June I had the honour of meeting up with and opening for the incredible 'Modern Maori Quartet' in Hofheim, Germany. The boys blew me away with their performance and the venue we played was stunning! I also had the pleasure of playing with the 'JETSAM 5' in Germany and playing for the first time in Baden, Switzerland at a very intimate venue called ‘Frau Meise’. Along side this I had private functions and house concerts. The 'Landestelle Sessions' began again, they will continue through until the end of summer! You can catch me there from 20.30 - 22.30 every Thursday, as long as the weather is good. This month has been a lot of fun. 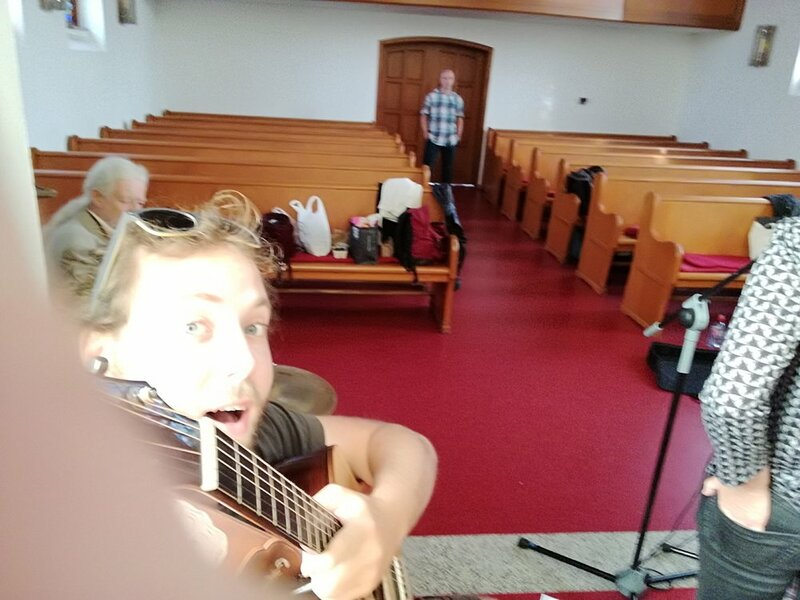 I had a great show at ‘Alpha Surf’, in a beautiful village called Estavayer-Le-Lac, in the French speaking part of Switzerland. 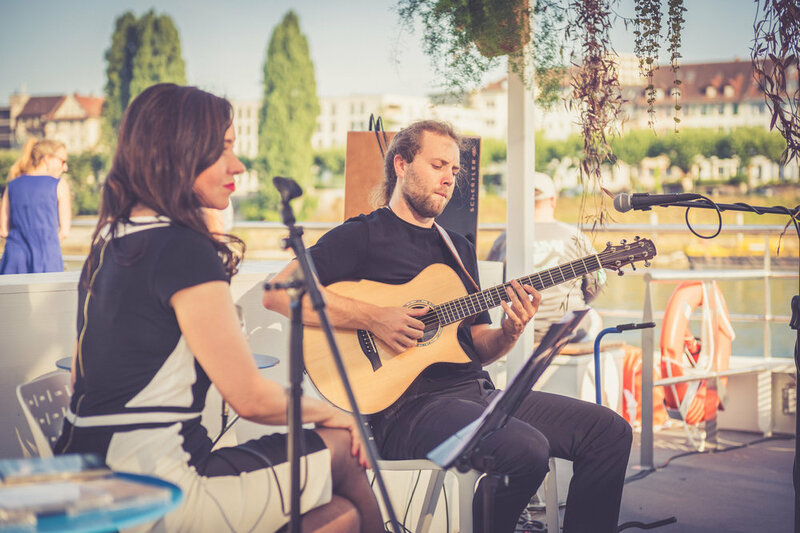 I also played a small acoustic covers gig with 'Nina Bradlin' on the new Basel boat bar called Rhystärn. Alongside the shows, rehearsals and meetings I have started a new YouTube series on my channel called ‘Office Sessions’. It’s a collection of videos exploring different methods of guitar video making. Check it out here! Oh and feel free to subscribe! Now, onto the coming months, they are going to be a lot of fun. 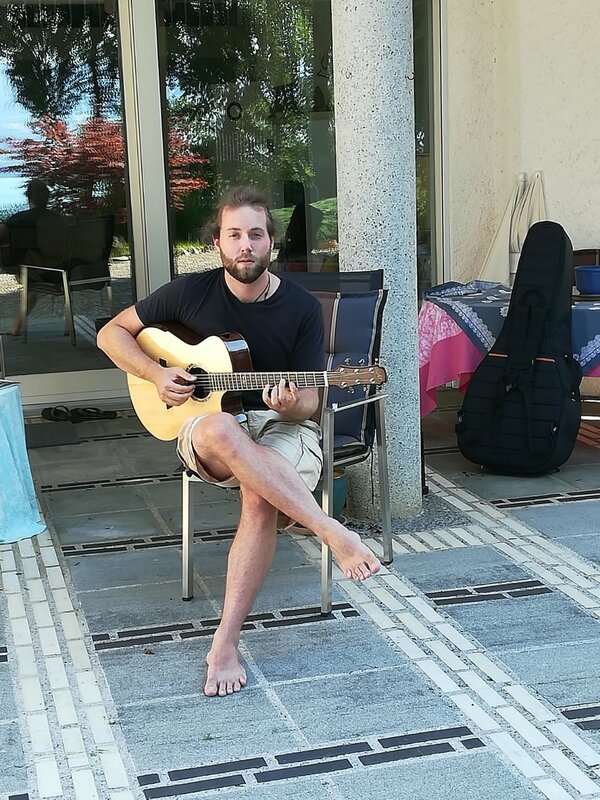 In the beginning of August I will be heading to Gams, Switzerland to meet the awesome team at 'Guitar-Repairs Urs Winkler' to hang out, catch up, play for their open house and of course stare at their incredible collection of guitars. I will also be heading to Amsterdam for the first time to attend a three day Gypsy Jazz workshop. September will see me visit Mannheim, Germany and Cremona, Italy. In Mannheim I will attend the 'Guitar Summit' to represent 'Maestro Guitars' and play a concert/workshop on the 7th. In Cremona I will do the same at the 'Cremona Musica', representing 'Schertler Acoustics'. October will also be exciting as I will have a show at the very beautiful theatre of 'Am Kastelberg’ in Waldkirch, Germany, on the 5th. I will play for the 'Dreiland Yoga Festival' on the 13th and lastly perform at the 'Nellie Nashorn Guitar Festival' in Lorrach, Germany on the 27th. For now that is all. I have new projects, repertoire and videos coming soon, which I am of course very excited to share with you.